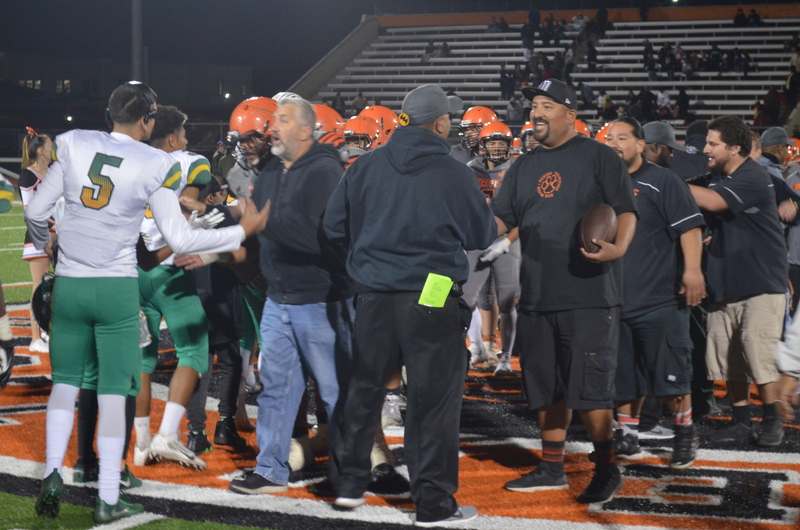 Two teams that looked evenly matched on paper collided Saturday night in Rialto. 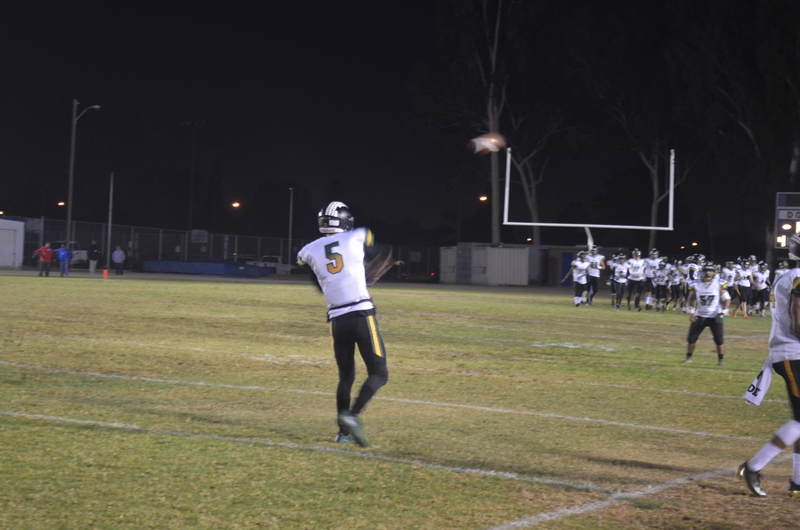 The stats would not predict what happened on the field Saturday night in Rialto. The passion of a team destined to return to greatness would overcome any stat or nay sayer. These young men and young woman would show everyone that this was their time, it was Eisenhower’s time! Eisenhower High School Varsity Football team led by #5 Cesar Ayala at QB, #11 Jordan Goodloe & #2 Joel Ayala plus the ever so constant foot of female kicker #33 Taylor Jackson propelled Eisenhower Football into greatness as they won another CIF Championship for the once famous high school. A school that has won CIF Championships before and has had multiple students go on to the NFL and win super bowls hit a 25 year dry spell that Coach Alvin Brown vowed to end. Coach Brown and his staff and student athletes came into this season thinking we want to go 1-0 each week. Coach Brown said the teams success came from the team listening to the coaching that they were given and executing each week. Highland High School looked more impressive on the stats sheet than they did on the football field. Eisenhower pushed forward and kept to their game and came out triumphant in this CIF Championship. You could see it in the kids faces they were so excited to have went from back to back 2-8 seasons to undefeated CIF Champions. Eisenhower has a long legacy of greatness and that can be a lot to live up to, but this team showed they were equal to the task of getting the job done and making the school and alumni proud!!!! 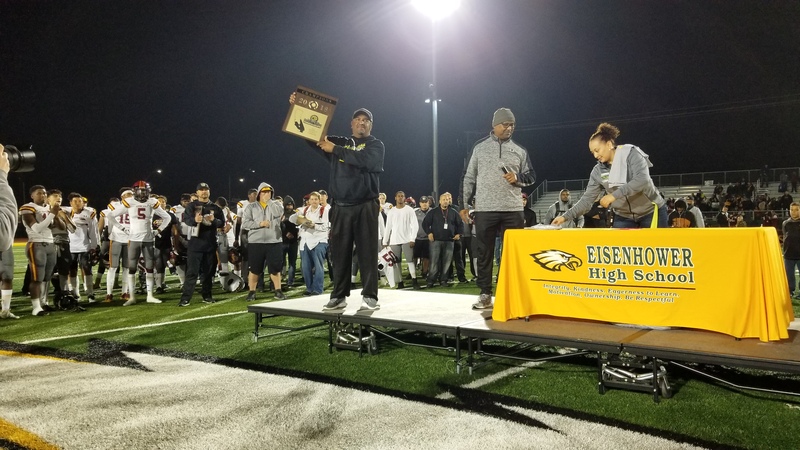 Principal Frank Camacho said “we are proud of the coach and the players making Eisenhower proud and bringing a ring back to Eisenhower High School football” Varsity Coach Alvin Brown was proud of his players and coaches for sticking to the game plan and forging forward with their plan of taking the season one win at a time. Only in Rialto can you have a Head Coach of a popular local football program treated poorly and tossed aside. Normally when coaches are forced out it has to do with poor performance from an amazing team or issues with parents & players. In Rialto we seem to mess things up in a very special way! Three years into his time at Eisenhower High School Head Coach Al Brown has resigned his position with the Football program in Rialto. 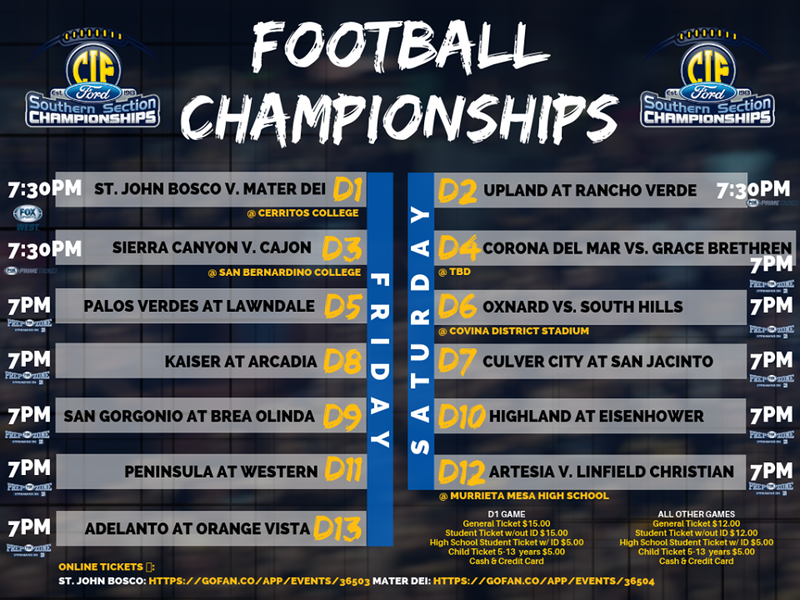 This news comes on the heels of the Eisenhower Eagles return to greatness with a Division CIF Title the first one in 20 years and a very close second in the State Semi Finals against a very powerful Fontana Kaiser Cats football team. Things all changed with the removal of Eisenhower High School Principal Scott Sparks who brought on coach Brown three years ago in an effort to return the football program to its former greatness. Coach Brown worked hard for two years under the support of Principal Scott Sparks to build a program that brought Eisenhower to its former glory but more importantly created amazing student athletes that are pillars in the community. The goal was to grow young student athletes that would continue to make Rialto proud. Coach Brown not only raised up some amazing student athletes but he brought a CIF championship back to the Ronnie Lott stadium! Being close to Coach Brown and some of his prior players (now playing college football) this season was tough on Coach Brown. It was tough because the CTE (career Technical Education) class Life Management was not offered to Coach brown this year as new Principal Frank Camacho took over for the departing Scott Sparks. So in order to feed his family and remain available to coach Eisenhower’s Varsity team this year Coach Brown was forced to take substitute jobs. Working as a substitute offers no job security or medical benefits, also coach Brown had to be prepared for a different teaching situation each day. This fact alone made his CIF season even more amazing given what the coach was dealing with this season. One constant face at Eisenhower High Football games was former Principal Scott Sparks. The former leader of Eisenhower High and a childhood friend of new Eisenhower High Principal Frank Camacho was at as many of Eisenhower’s games. Scott Sparks watched what he started blossom into a season and record that Eisenhower Alumni could brag about! According to Coach Brown he was told that he would have a teaching contract this week solidifying his place with the Football team. When the deadline to offer this contract came and went coach Brown had no choice but to resign. Eisenhower High School staff have not been happy this year talking about how much life at the school has changed in just one year. 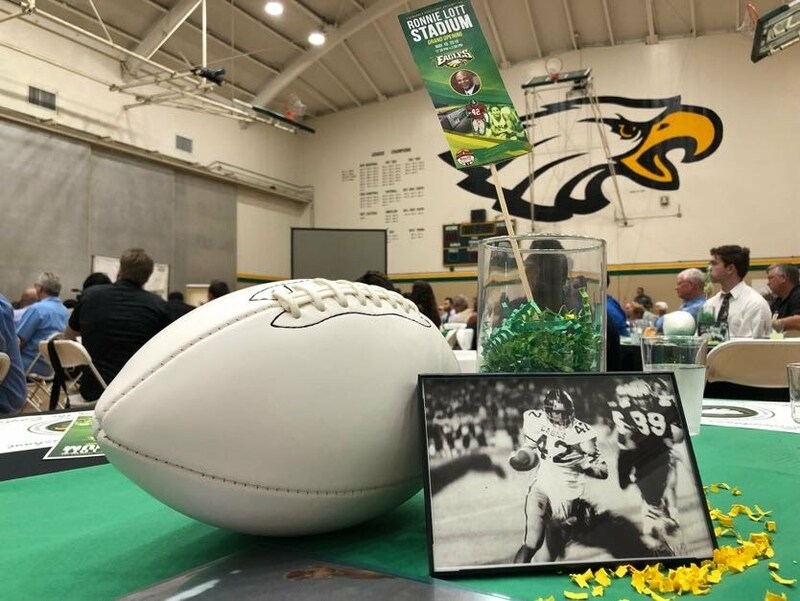 Many people close to what Coach Brown was going through this school year hoped that the CIF season would be enough to prove to Eisenhower Administration that Coach Brown was a vital piece to the positive school culture at Eisenhower. This writer is left wondering what is going on at District Office and what does Dr Avila and the School Board think this latest problem will do to moral and the culture at Eisenhower? According to Syeda Jafri the Communications Director from Rialto Unified “the district has not received a formal resignation from coach Brown, so it would be difficult to comment further on this matter”. Since posting this story it has come to light that the team is still waiting for the end of the year banquet. We have heard from sources that the school district is waiting for the CIF rings to come in so that they can be presented at the banquet. The rings can take 6 weeks to be ready. One thing that we learned about this year was how difficult it is for schools in low income communities to get their rings. Kaiser High in Fontana was gifted a grant at the Inland Valley Classic Football game on January 26th to buy their CIF rings. Eisenhower High Schools rings are being taken care of by District Office. Most gut wrenching about this move is the $300k video that Westbound Communications did for San Bernardino on how hard Cajon High School in San Bernardino worked to keep an amazing sports program together. People gave up jobs and changed their lives to keep the coach in place and make it impossible for him to want to leave. One thing that Athletic Director Richard Imbriani says in this video is we teach kids life skills and how we don’t quit on people. Well apparently Rialto has a lot to learn from San Bernardino! Eisenhower High School has officially broken through and done what many called impossible. 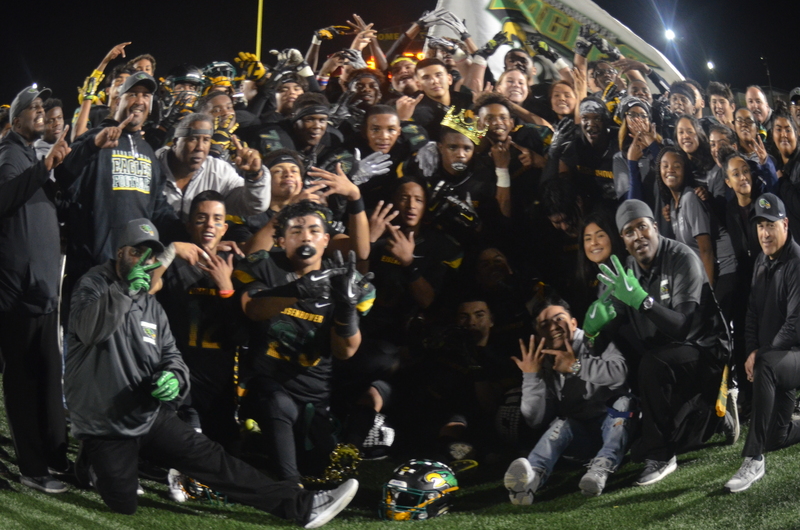 In a city of Rialto’s size with three major High Schools all competing for the talented young youth building a High School program that can return to a CIF final wasn’t an easy task, but it has been done. On Friday November 16th in Pico Rivera Eisenhower entered the El Rancho High School with a passion to win and get a chance at a CIF title ring. El Rancho a much different team than the Chaffey Tigers of the week before from the begining you could tell this game wasn’t going to be a cakewalk. El Rancho had stands full of fans and plenty of fan fair and flair to go with it. 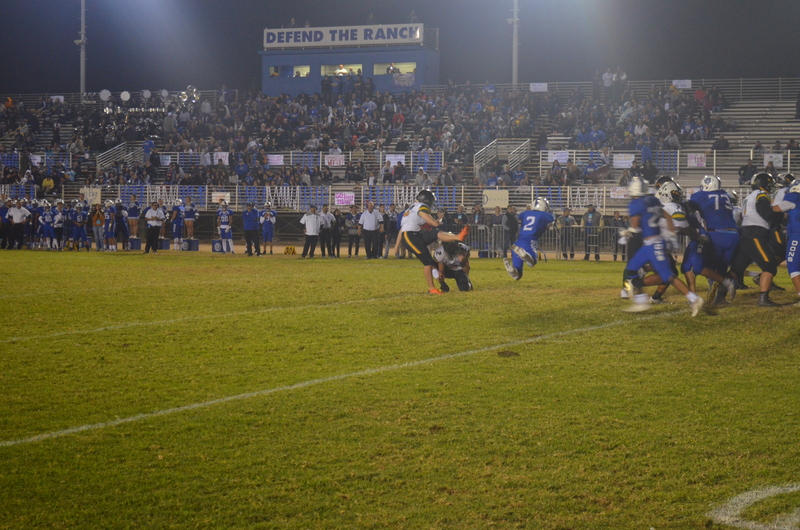 El Rancho known for trick plays and onside kicks came to play and in the end Eisenhower was to the task. Eisenhower as an entire team won this game as it was done with touchdowns and field goals this time around under the perfect foot of female player Taylor Jackson. Yes you heard that right a girl playing Varsity Football in a game that mattered scoring points that were crucial! 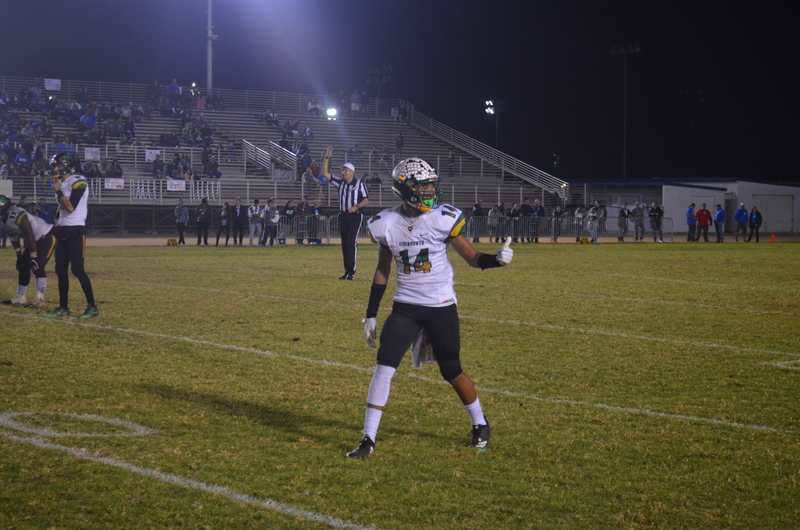 Another stand out in this game and the person responsible for getting Eisenhower on the board early was #14 Dayveon Benton who turned a high snap over the El Rancho Quartbacks Head into a fumble recovery and touchdown! Quaterback Ceaser Ayala orchestrated a masterful game where the ground and air attack were both viable options. He went 8-17 for 138 yards and 1 touch down. Joel Ayala a player chosen to stand among other High School Players last week for the title of So Cal Player of the week carried 12 times for 49 yards. Jordan Goodloe put Eisenhower on his back against El Rancho with 23 carries for 237 yards and 2 touch downs! Jordan Goodloe was getting down and dirty on El Rancho’s old style real grass and dirt field and you could see that on his #11 Jersey. Eisenhower plays the CIF final game against Highland High School from Palmdale on Saturday November 24th at Eisenhower High School. Both teams come into this game with a 13-0 record this season. This final game will be for the title in Division 10 title. Rialto it is time to come out and fill the stands of the NEW stadium. Come out and support our hometown teams return to greatness! Cash and Credit Card accepted! After struggling for two years in a row Eisenhower High School has come on with a fury this season with a 12-0 record after shutting out the Chaffey Tigers 28-0 at Chaffey High Stadium Friday. 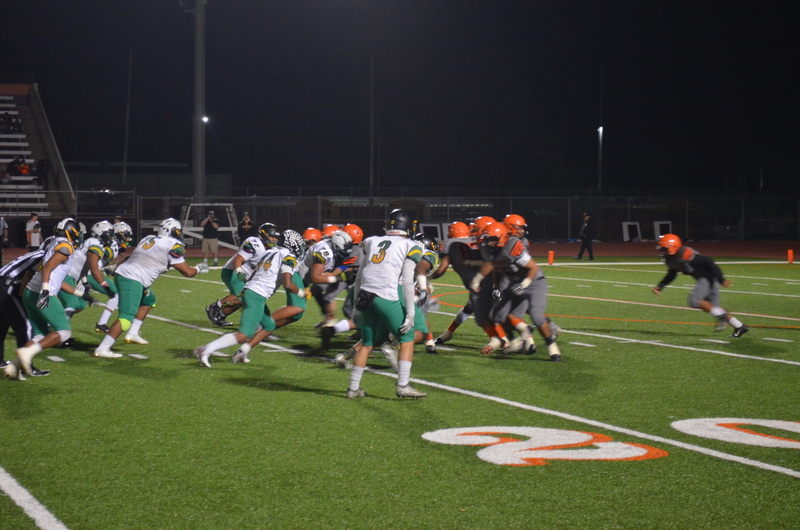 Chaffey used a mostly ground game that never got them into the end zone. Eisenhower traded shots in the air and on the ground to move the ball into the end zone multiple times Friday. Coach Alvin Brown said the players are playing so well because they are listening to what they were told. We taught them what needs to be done and they are doing it. They are reacting to on the field coaching and playing their hearts out. Two wins are all that stands behind a section title something that has eluded Eisenhower since 93. One way they were able to get back into contention was getting out of the Citrus Belt League and into the San Andreas League. Ronnie Lott a Eisenhower alumni pumped everyone up by posting a youthful chant to the young team and players on Twitter. Another standout helping the Eagles make sure every point is accounted for is the new Field Goal kicker Taylor Jackson. Two years ago we watched Eisenhower struggle with field goals. Now they have a female kicker who has only missed two kicks all season!!!! Go girl power!! Eisenhower’s next game is at El Rancho High School in Pico Rivera. 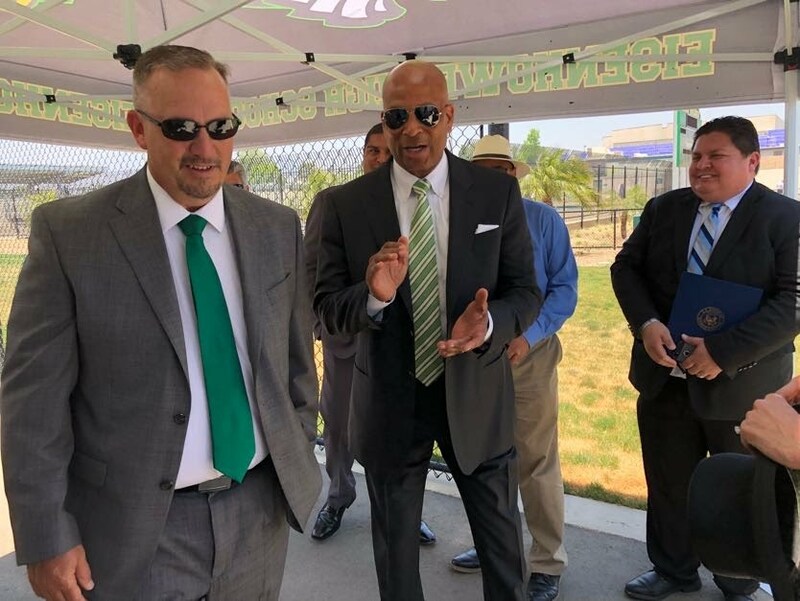 NFL Hall of Famer Ronnie Lott returns to Eisenhower High for stadium dedication. Before he was dubbed “the greatest complete player” in the NFL, Ronnie Lott was a standout athlete on the basketball court and the gridiron at Eisenhower High School. 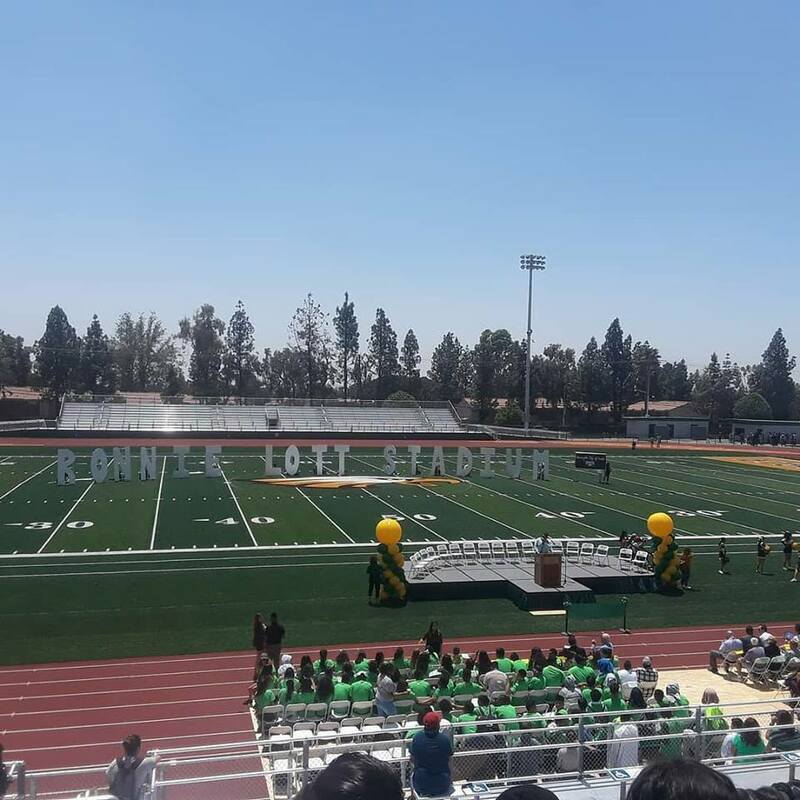 On Thursday, May 10, the Rialto-raised former proballer was invited back to his high school alma mater for yet another recognition, the dedication of the state-of-the-art Ronnie Lott Stadium. Eisenhower High Principal Scott Sparks introduced Lott, “his childhood football hero” to the crowd sitting in the new bleachers, including some of Lott’s former classmates and dozens of dignitaries in attendance. “This Hall of Famer sat in the same classrooms that you are sitting in today. He went to the same cafeteria that you go through every day. He proved to you that you can come from Rialto and be the best,” Sparks said. As part of the dedication ceremony, Lott shared how his former coach at Ike, “Coach Christopher,” made a deep impression on his outlook in life. While Lott has seen success in the NFL playing for the San Francisco 49ers, Los Angeles Raiders and the New York Jets, he still feels he has a lot of work to do. Lott also announced that on behalf on him and his wife, Karen, they would be granting a $1,000 scholarship to the top athlete at Eisenhower starting this year. “We’ll be doing that every year for as long as I’m alive,” Lott said. The stadium was approved by the Rialto Unified School District Board of Education after a $98 million school bond passed in 2010. The bond, Measure “Y”, was authorized to acquire, construct, and improve classrooms, and support facilities and increase student access to modern technology, according to RUSD. The $7.3 million dollar stadium can seat 5,000, 4,000 home and 1,000 visitors, features a ticket sales area, concession stands, restrooms for both home and visitors, synthetic turf and field for year-round use, discus and shotput fields, energy efficient LED stadium lights, a state-of-the-art sound system and wireless scoreboard. If you haven’t been downtown lately you may not know that there are some changes going on in our towns center. One of those changes is a new event called Lunch Break. Destiny a local young adult wanted to do something for the art community that did force us to drive out of town and fight traffic. 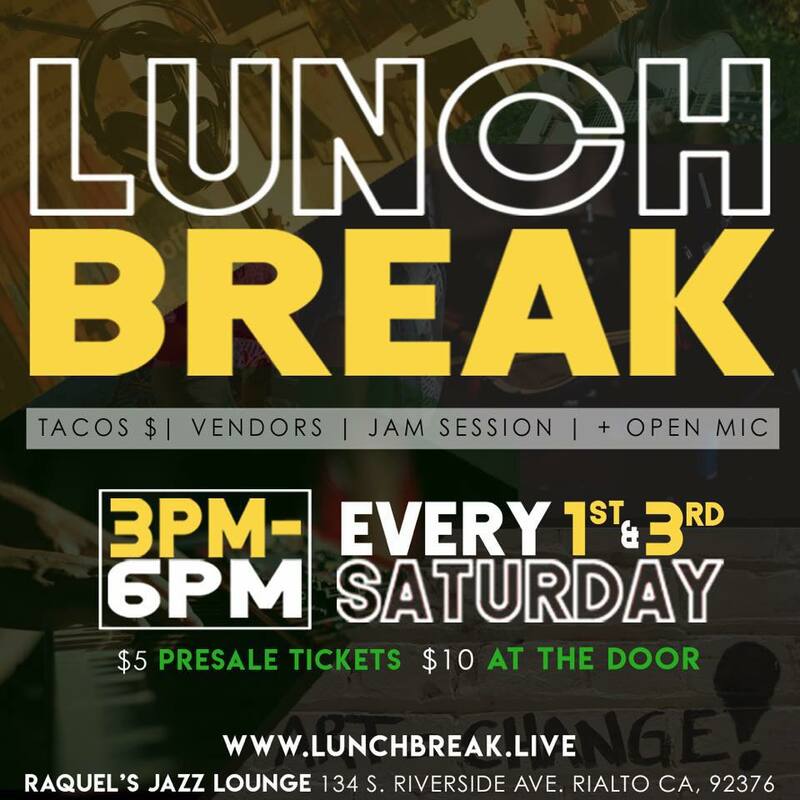 Lunch Break was created as a way to bring together community in the Inland Empire through arts, music, and love. Too often we have to travel to Los Angeles in order to get away, decompress, and take a BREAK from the everyday routine necessary for keeping our community afloat! Now we have the space in our own backyards! Join the OPEN MIC portion with a live band to accompany you! 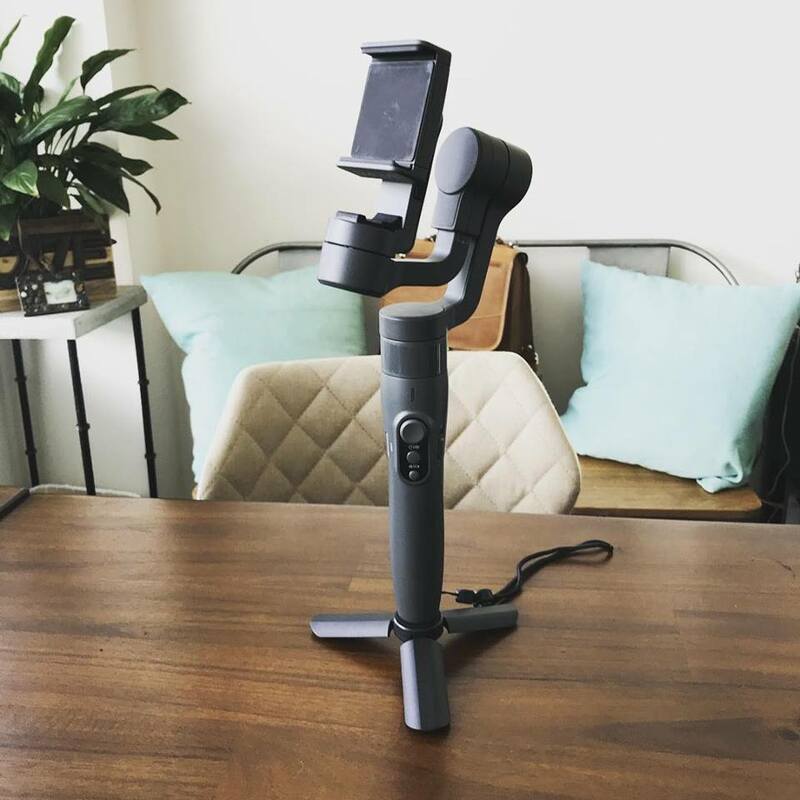 Leave inspired, refreshed, and connected. About a year ago we had the opportunity to sit down with the new leader of Rialto Unified School District and in our first interview Dr. Avila laid out a plan that sounded great. Well to see where this plan led us we decided to watch the plan move through the process and look for the results. Dr Avila took the initiative to make sure we had time to revisit the previous interview and go over where we were a year later. As it looks things are progressing pretty well, there were a few bumps in the road but all in all I’m not sure another School District in the area can boast a leader with a clear vision that is producing results and allows to explore other avenues along the journey to the plans end. One of my favorite parts of the long range strategic plan is the fact that it allows for deviation from the plan to explore side avenues that might offer benefits. Question 1. You eased yourself into the district slowly implementing your plan. How has that gone? Question 2. Last interview you spoke about your Random Act of Kindness imitative how has that gone and what have you done in your 2nd year as Superintendent of RUSD? Question 3. In our 1st interview you highlighted awards the schools were getting for excellence. What awards have schools or administrators obtained in the last year or so that we haven’t covered? Question 4. Last interview you spoke about up coming literacy programs a lot has happened since our last interview in this area. How has the Literacy launch gone and what programs are we working with? Question 5. Last time we spoke about streamlining STEAM programs k-12 how has that gone. Question 6. How can we offer more classes that prepare kids for skilled labor jobs? Currently when staff retire from these classes the classes are lost. Is there a plan to address this? Question 7. Last interview you spoke about your desire to have school principles reach out to the community to work on bringing in a more diverse learning environment into the schools. Have you seen movement in this area? Question 8. The district not only went through its own strategic planning and each site had their own stab at creating plans how has that gone and what was learned from this process? Question 9. We spoke about the issues with communication at RUSD. 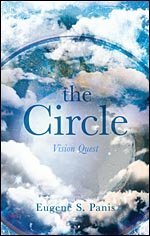 How has the communication issue progressed as you have come on board? What worked? What sounded good but didn’t produce the required results? Question 10. Rialto has had a long history of issues within the Special Education Program. What are your plans to begin making strides in this program to a better place? Question 11. Finally what are your wishes for the remainder of the current school year. Any milestones your looking forward to celebrating?